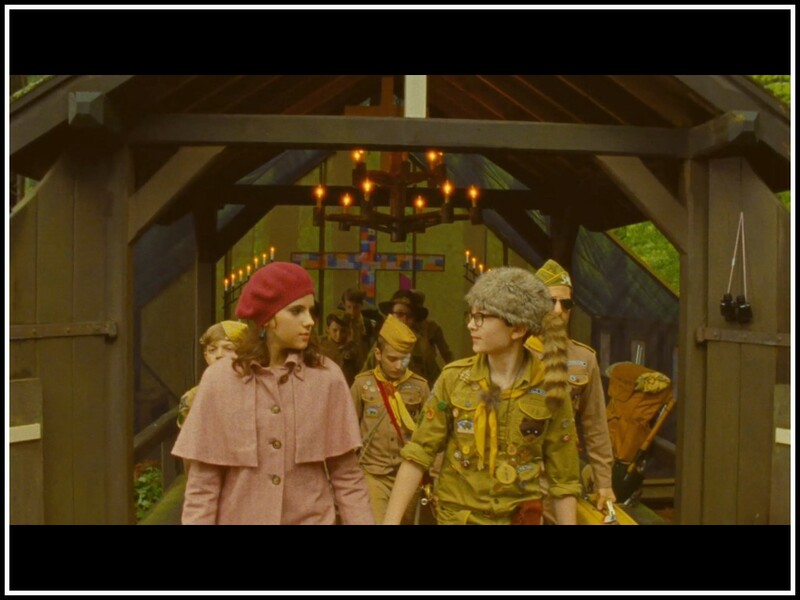 I just finished watching Wes Anderson's Moonrise Kingdom, which is, hands down, one of the most whimsical, magical films I've encountered in many moons. An Anderson fan, I hesitated to see this when it was released as mixed reviews (which usually happens in Anderson films anyway) many discounting it as "a series of poses and postures" often singling out the "awful" acting of the two leads discouraged me. Well, I was a silly goose, and those critics, as earnest as they may have been, couldn't have been more wrong in describing this thing if they'd tried. The leading couple, Sam (Jared Gilman) and Suzy (Kara Hayward) are a pair of emotionally challenged 12 year olds who fall in love during a performance of Britten's Noye's Fludde. I couldn't imagine either role cast better than here, nor more nuanced performances coaxed by a director who actually "gets" kids - particularly troubled ones. The story begins when Sam, a highly decorated, though not well liked cadet Sam flees the confines of Camp Ivanhoe and his Khaki Troop (think Boy Scouts of America) to run away with unpredictable and misunderstood Suzy. Their inventory for survival includes a kitten in a basket (with accompanying cans of gourmet cat food), a battery operated record player and a suitcase full of stolen library books. My kind of kids. Living on a remote island (about to be hit by the storm of the century) they can't really escape far . . . or can they? Through (several) ensuing chases, unsuccessful captures, and re-escapes the story grows exponentially, layer by layer as it introduces us to the foibles, quirks and ticks of the residents as our Island Romeo and Juliet explore their burgeoning sexuality (all tastefully within the confines of its PG-13 rating). Speaking of Noye's Fludde, Anderson had me from the start, as any movie that bookends its opening and closing scenes with Britten's Young Person's Guide to the Orchestra, has already got plenty going for it! And Britten's music (in addition to large chunks of Noye) looms large throughout, as does that of Schubert (An die Musick), Mozart (Cosi's Soave sia il vento) Saint Saëns (Carnival of the Animals) and Hank Williams. So, too, does the score by composer Alexandre Desplat who pays tribute to Britten (remarkably directly in the closing credits, where his own "Guide to the Orchestra" is narrated by the film's hero). Rarely does one find film music these days that is this integrally bound to the storytelling that it's virtually impossible to imagine the story without it. Anderson sets his tale circa 1965 on the fictional New England island of New Penzance. The nod to Gilbert and Sullivan is here more dramatic than musical, but nonetheless unmistakable. The parallels between Moonrise's young Sam, and Pirates' Frederic are plentiful. While entirely original, Moonrise nonetheless feels punctuated throughout as it evokes gauze-covered memories of other things. It was constantly conjuring fleeting instances causing my mind to race to discover connections between it and Romeo and Juliet, The Tempest, The Keystone Cops, Lord of the Flies, and more. Robert D. Yeoman's remarkably nuanced cinematography makes every frame look like a page from an old family photo album, capturing summer camp, skinned knees and emotional secrets barely covered through veils of thin smiles. 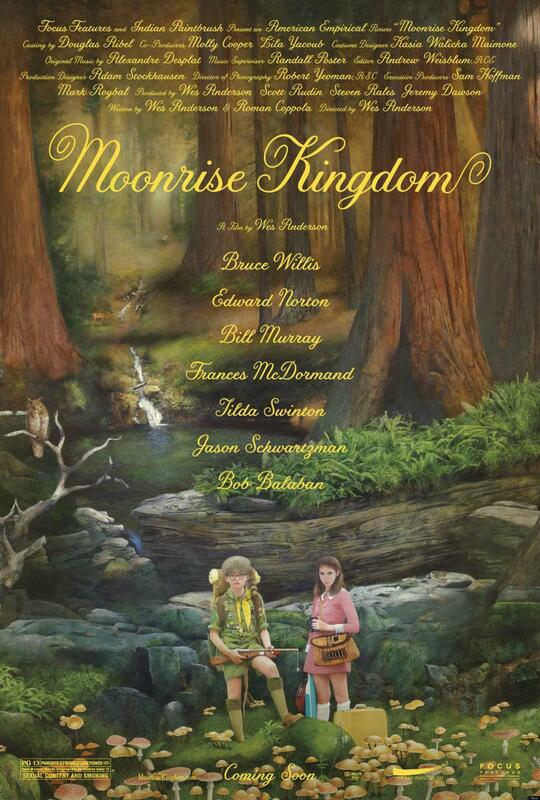 Moonrise Kingdom, indeed. 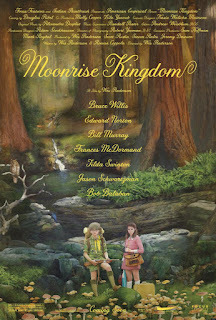 Though Sam and Suzy are the heart of the film, Moonrise is truly an ensemble piece and Anderson is able to evoke marvelous, sometimes larger than life, performances from an inspired cast of Bruce Willis, Edward Norton, Bill Murray, Frances McDormand, Tilda Swinton, Jason Schwartzman, Harvey Keitel and Bob Baliban (who serves as narrator/Greek Chorus), and all of whom create the believable, quirky, characters who populate this magical island town. In my estimation critics who found this "stifling" simply are never going to like films made by the likes of Mr. Anderson, directors who essentially eschew The Hollywood Way, as they put out beautiful, boutique films for small audiences willing (or wishing) to escape into the fantastic worlds they've created for us. For those not willing to do so, I suppose these films really can be, as one critic described Moonrise "a long, dull exercise in alternative comedy." For the rest of us . . . it's a dream.